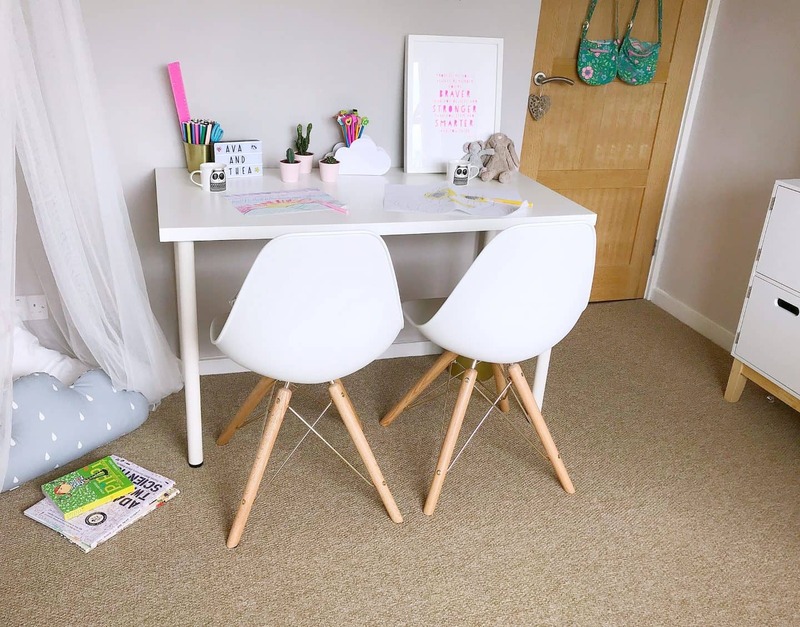 When I began to plan our new creative space and playroom, I was keen to create a room that the girls wouldn’t grow out any time soon. We have space for their dolls’ houses and Sylvanian Families, but the key feature will be the desk and chairs. They are both very creative and love drawing and writing. I want to make a great space for them to create, that will be perfect for homework as they get older. We have ordered some new desks for the girls, and are using an old IKEA desk from our office until the new ones arrive. 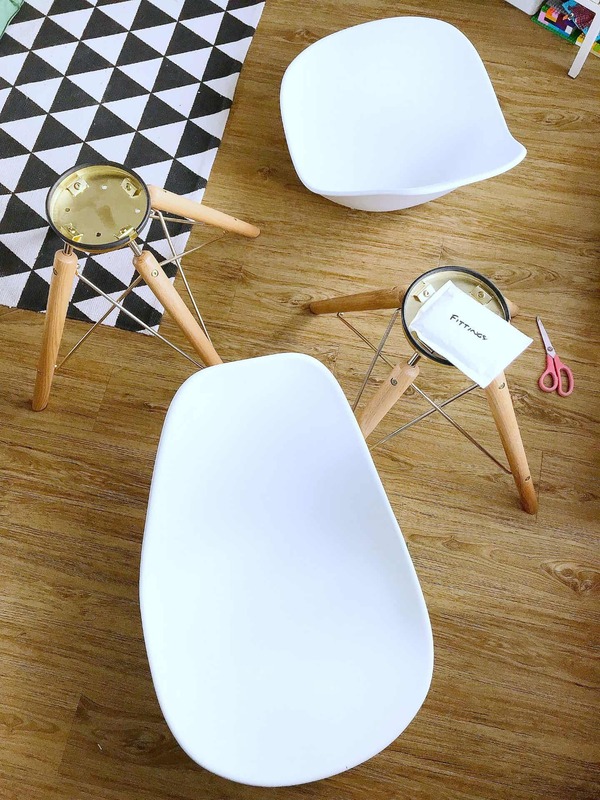 Online furniture superstore Cult Furniture have sent us this pair of their Moda Dining Chairs. 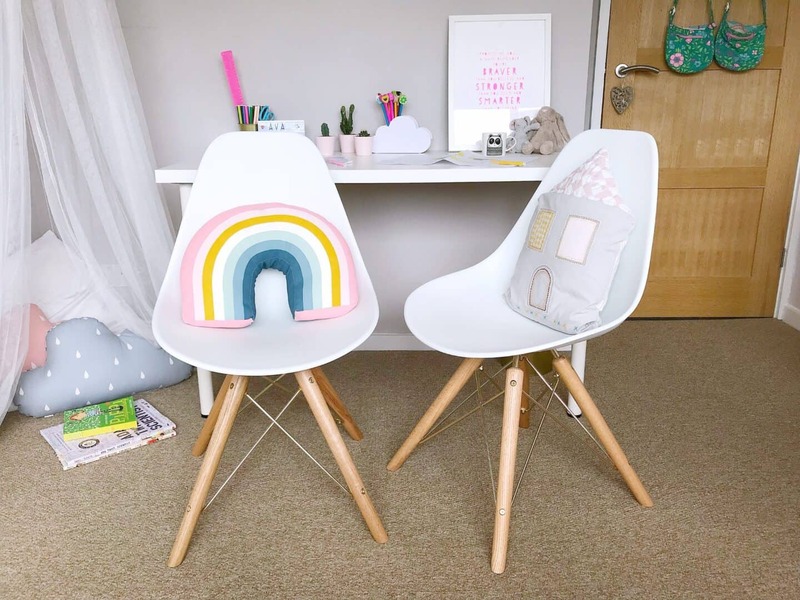 I think they are the perfect chairs for kids to grow up with. These stylish mid-century style Moda dining chairs come in a huge range of colours and leg styles, starting from £69 each. I was really tempted by the beautiful pastel coloured versions, as they are so pretty. I decided on white though, as whatever decor we choose in this room, these chairs will go perfectly. 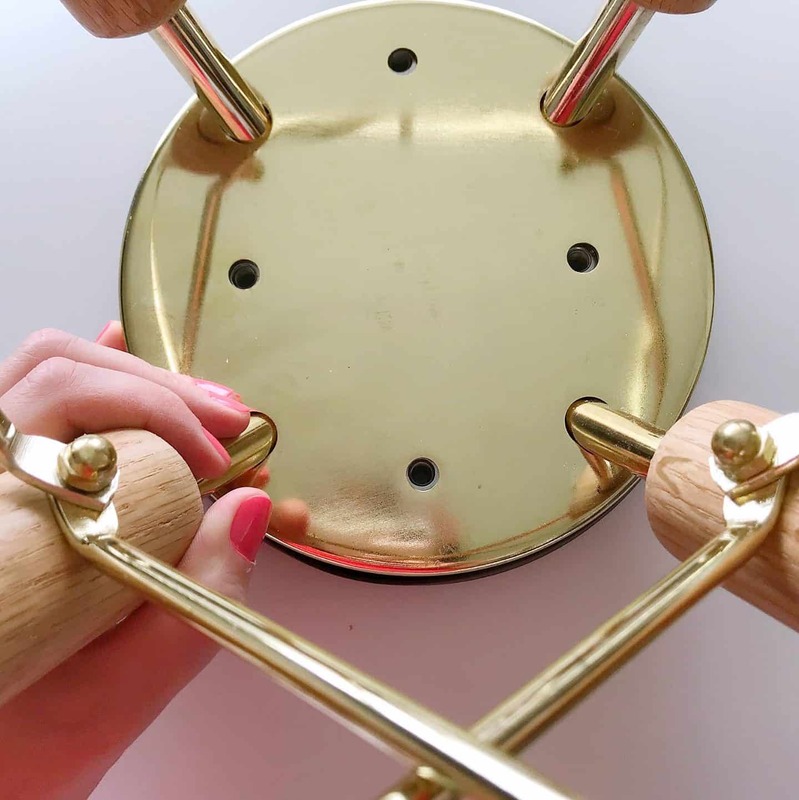 We chose the natural oak and gold-coloured legs, as they are a design classic that won’t ever date. Cult Furniture do sell child sized versions of these chairs but I think Ava is a bit too tall for them. They would be ideal for younger children though, at £29 each. We chose the full-sized chairs, as the girls are 7 and 5, and both quite tall for their age. That also means they will grow up with them, so they won’t need replacing as they get taller. 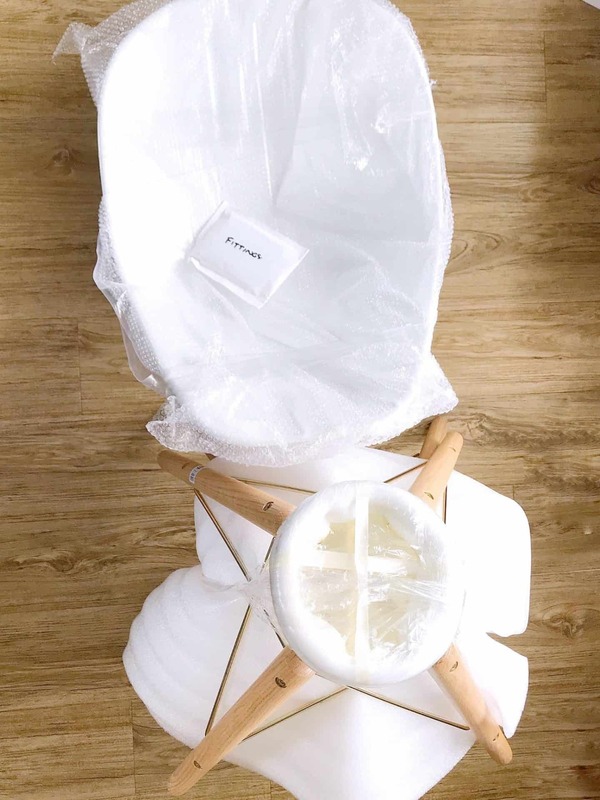 The chairs arrived in a large box, with the legs and seats separated to make them easier to transport. Each piece was well wrapped, and the fittings were in an envelope, with an allen key, so I had all I needed to put them together. The top of the oak legs were a little rough, so I gave them a quick sand, to ensure there would be no hurt fingers. I bolted the legs onto the seats, which was very easy. I found it best to upend the seat and put it over my lap to get it the right angle so I could see what I was doing, to tighten the screws. The seats are slightly angled, so the legs only go in one way, and all in all they took me about a quarter of an hour to put together, including sanding. These chairs are heavy and solid, and as you can see they look great. They are so stable that I won’t have any worries about the kids climbing on them, or tipping them over – they are going no where! How Do The Girls Like Their Chairs? 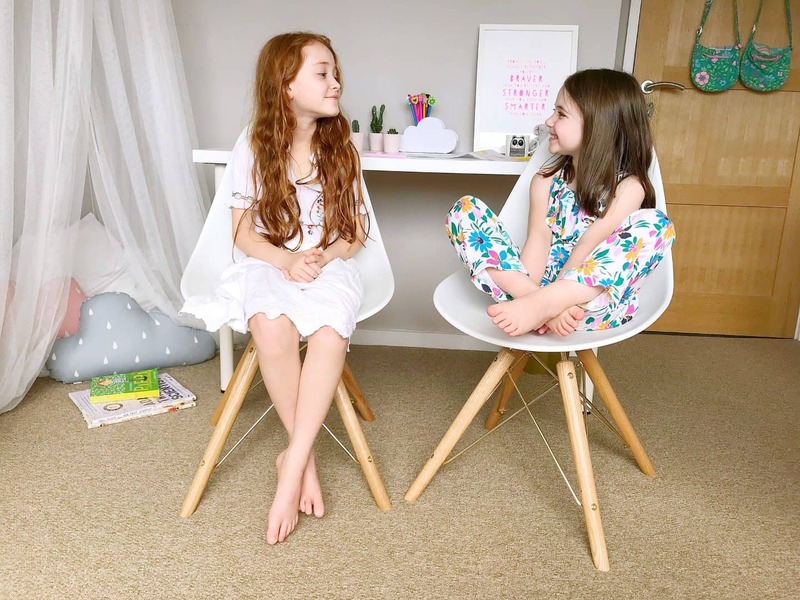 Ava and Thea are already enjoying using the chairs and temporary desk. As you can see, Ava can just touch the floor with her feet and Thea is comfy in her chair too. I was planning to pop a cushion onto the seat of Thea’s chair until she gets a little taller. But she is happy to kneel up, so I don’t think we’ll need to. 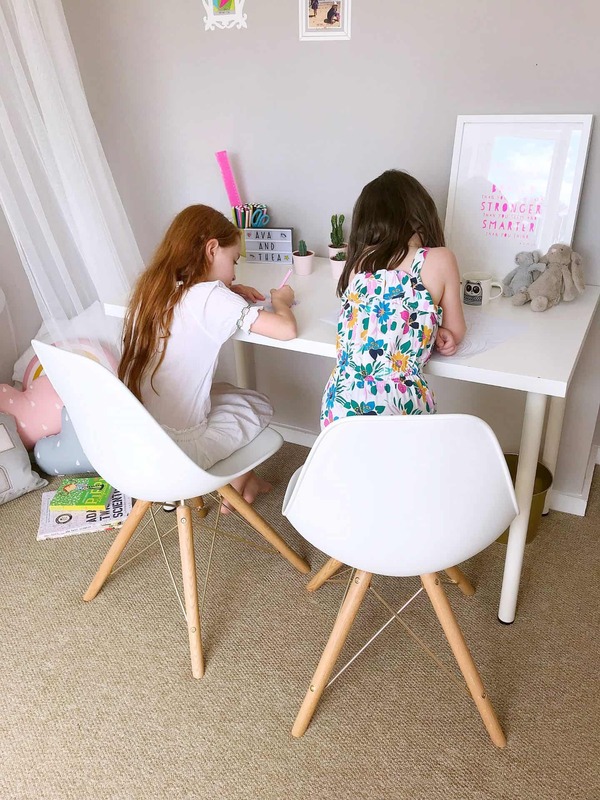 They love sitting together, drawing, and it’s lovely to see them sharing the space so happily – long may that continue! I bought a gold-coloured waste bin and plant pot for pens from IKEA, to tie in with the gold detail on the chair legs. I can’t wait to put up the new desks next week to get the finished effect. I’m so pleased we decided on grown-up chairs for the girls to grow up with. They will be in this room for many years to come – unless I decide to steal them for our dining room! What do you think to the chairs we’ve chosen? Having an easy setup is always nice. 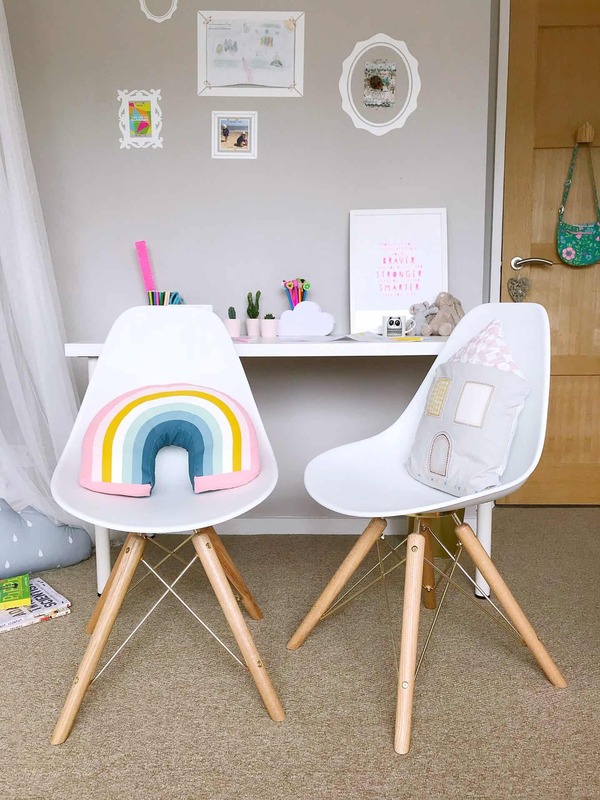 Those chairs are prefect for them to grow up in. I would totally rock those in my own home. They are really lovely aren’t they? They’ll never date. We have the same issue in our dining room Ricky – I’m very tempted to upgrade now I’ve seen and felt the superior quality of these ones! I think you were right get the full size versions, they’ll have them as they become teens and beyond that way. 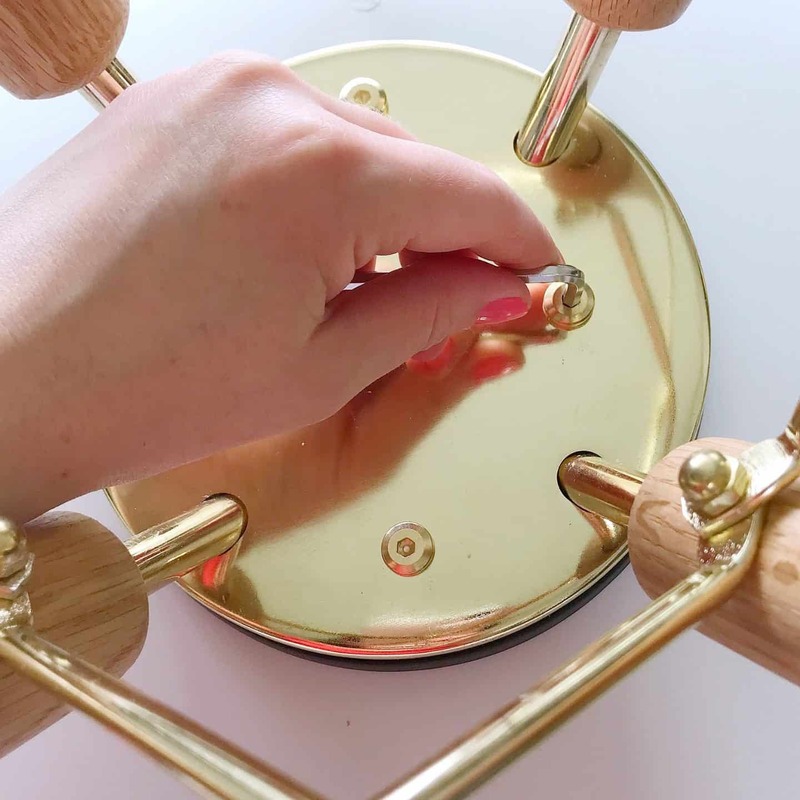 I’m just design my son’s next stage bedroom and there is so much to consider! 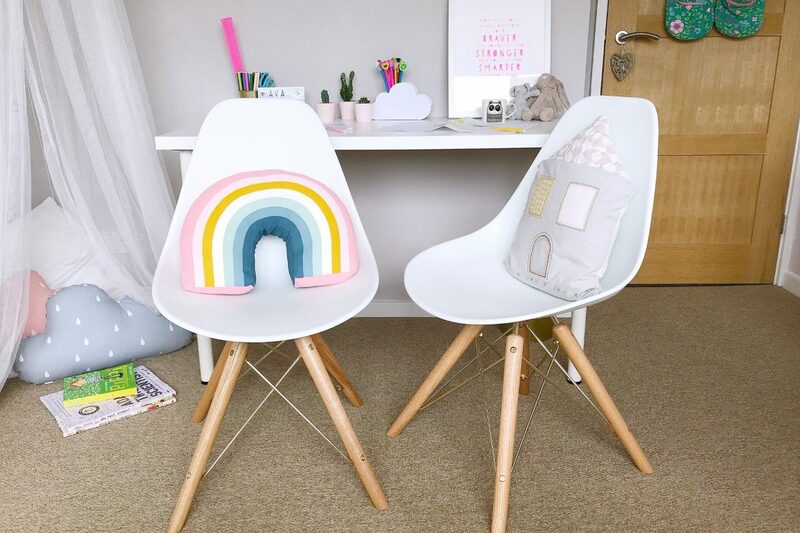 Yes yes yes to the chairs, plus the photography plus the rainbow cushion. Good work there. These chairs are generally super comfy and very sturdy. Love the light grey and pink accessories. such a happy room this one! Great choice. They look lovely. I’m having the same dilemma when it comes to wardrobes. Do I get little kid ones or normal sized ones? They grow up so quickly it’s often better to just go with full sized versions. Those chairs look lovely ! They seem very easy to put together as well which is a bonus.